I recently bought MyMail Email Newsletter plugin from codecanyon for this blog to offer Email newsletter subscription option to my readers. If you are looking for MyMail plugin review, then you are in the right place. In this post I will share why I moved to this plugin, and review about this plugin in detail. What Service I used before for Newsletter Service? Like all other bloggers, I also started from FeedBurner service to offer Email subscription to my readers. But I’m not satisfied this service from the beginning itself due to lack of features. 1. You cannot communicate or build relationship with your Subscribers: The major drawback of this service. Here we are just sending blog updates and not making any communication or building relationship with our subscribers. If you want to build any business or sell anything, you need to build relationship with your subscribers. In most cases bloggers won’t sell much like any internet marketers do, but building relationship with your subscribers surly helps in long term on any business. Consider an example: If you nominated for any award and you need some votes to win, that time you need people who listen your words and not the search engine visitors. So to build relationship with our subscribers we need to send custom messages and not only the daily blog updates. Sending custom message never ever happen with feedburner. 2. I don’t need to send Emails daily: Every time I publish post here, those post went to subscribers emails address. But I believe this is some kind of spam. So I want an option to stop sending mails daily. But unfortunately there is no such option in FeedBurner. 3. They may close this service: There are few rumour that Google may shutdown Feedburner service. I know many popular bloggers who made a switch to other services. This is just a point, and this not the main reason for me to switch to MyMail plugin. These 3 are the main problem (actually first 2) which I faced with feedburner. I know there are many more problems exist with feedburner, but I mentioned only what I missed most, not what others are missing. In the middle I switched to Aweber service to give it a try. I liked this service very much, but this service is not cheap and it didn’t work great for this blog in terms of scalability and maintenance cost. Here are the few drawbacks that I faced with this service. 1. Cost: This is the one main reason why I left Aweber service. I bought 1 year service with them, but I cancelled after using 6 months. I was paying aweber more than what I was paying for my hosting account! 2. Scalability: This service is good for some small subscriber user base. If your list start growing, then you have to spend lot of money to maintain this service. To give you an idea, If you have 5,001+ subscribers in your list then you have to pay $69 to maintain that list! This is not an ideal solution for bloggers like me. So keeping future in mind, I stopped using this service. 3. You use or not, You have to pay: Another main reason. Whether you use them or not, you have to pay monthly subscription fee. I still remember, I paid 3 months fee without sending single mail to my subscribers. Because of above disadvantage, I stopped using this service and again I switched back to feedburner. I still recommend Aweber if you are ok with the above 3 points. I’m not the only guy who left this service, even some big bloggers also did the same. For example, copyblogger one of the most famous copywriting blog stopped using aweber and switched to feedblitz service (It’s highly not recommended, instead you can try jetpack plugin), makeuseof one the most popular tech blog also stopped using aweber and moved to in-house solution which is almost similar to what I’m using and explaining in this post. Both of these blogs have huge number of subscribers, for example makeuseof currently have 6,00,000 Active subscribers! You just calculate how much they could have paid if they used aweber. No, I’m not against to aweber, I still love and promote them. But Aweber is not for typical blogs or bloggers. They are good if you offer buy this, buy that-type of service. Note: After switching Aweber to feedburner I lost 400+ active subscribers and 1000+ unconfirmed subscribers! I still have that subscribers database, but I’m not using those list anymore. Why because, I never sent any mail for them for almost 1+ years. In most cases they don’t remember who I’m or my blog. If I sent mails to them now, they might mark my mail as SPAM. I know few E-mail marketing company which offer free service by providing limited number of subscribers and features. But I never tried any of those service because of scalability and few other issue. If you want to give them a try you can check out these services Mailigen (5000 subscribers free), Mad Mimi, MailChimp etc. None of them comes close to the service what I’m looking for. I could try mailigen for free up to 5000 subscribers, but after 5000 subscriber it also becomes costly. So I dropped the plan. The solution that I found was MyMail plugin+Amazon SES+WordPress. I hope you are already using wordpress platform, so you need MyMail and Amazon SES. You can use MyMail plugin without even having an account with Amazon SES, but it is highly recommended to have an account Amazon SES. Amazon Simple Email Service (Amazon SES) is a cost-effective outbound-only email-sending service built on the reliable and scalable infrastructure that Amazon.com has developed to serve its own customer base. With Amazon SES, you can send transactional email, marketing messages, or any other type of high-quality content and you only pay for what you use. In other words, we use amazon server to send mails to reach subscriber inbox instead of reaching spam folder. 1. Most web hosting account have email sending limit. If you reach that limit you cannot send anymore mails that day. 2. If you use default hosting account, then there are high chances of landing your mails in spam folder. Currently I’m using Inmotion hosting (not recommended), and all those mails are landing in my Inbox only. But still I’m using Amazon SES because it’s really very cheap. In Amazon SES you will pay only what you use and their pricing structure is really very attractive. If you send 1000 emails then you have to pay $0.10! And you are not charged if you don’t send any mails. Based on that charge, if you calculate for 10,000 mails, then you have to pay $1. If you calculate it for 100,000 emails, then you will pay as less as $10! Now we can build a big list without worrying about cost, maintenance etc. The problem with Amazon SES is, you need a system to interact with Amazon system using their API. 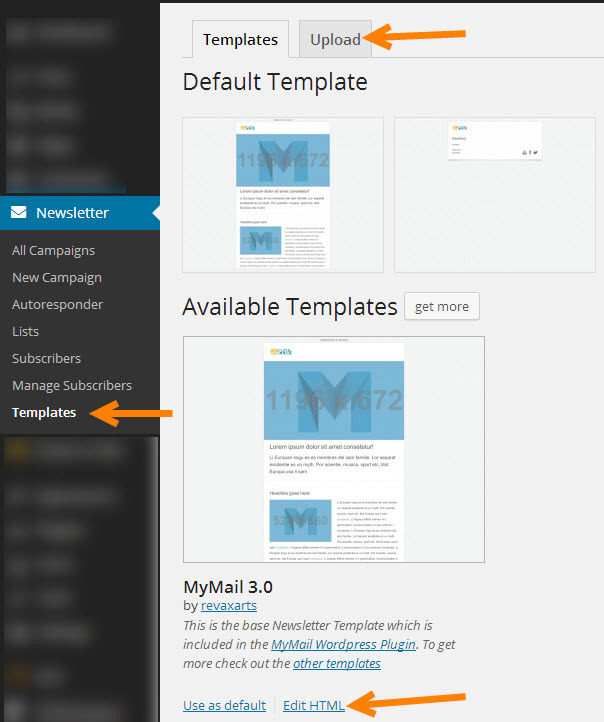 But I’m not a coder to build it for myself, that is where MyMail Email Newsletter Plugin comes. Who using Amazon SES solution? I personally using this service with MyMail plugin, but before I took this decision I made a good research over online whether to go for it or not. After doing all research I finally decided to go with them. Example: Makeuseof themself using this Amazon SES service with 6,00,000+ subscribers on their list! and all their newsletters are safely landing on my Gmail Inbox. I’m one of their subscriber. If you are still not aware of the plugin then you are missing a lot with your blog. I also recently came to know about this plugin, as soon as I came to know about this plugin and Amazon SES service I felt like I finally found a solution to my list building problem. This is the some of sort of solution I need, I guess for all blogger community it is must. Most of the blogger dream is to build a email list, but due to cost of Email marketing service provider most of them fix to feedburner service. This is a complete email marketing solution for your wordpress blog. It has almost all the feature that Aweber or any other standard email marketing service provider provides. If you use this plugin, you can send beautiful custom Email newsletter to your subscribers within in your WordPress blog and thus you can save time and build the relationship with your subscribers. You can use this as an alternative to your feedburner as well with even more options. For example You can send Emails to your subscribers automatically when every time you publish a post or send on weekly or monthly basis. There is a lot of other options available to play with it. If you want you can use the auto responder feature to send emails automatically to your subscribers after few days or you can use this feature to send pdf book after confirming their email subscription or you can use this feature to promote old articles or promote any product after sending the sequence of emails to build trust. The uses of auto responders are endless. It’s all depends on how you use this feature. Sometimes you may need to create a different list on single blog. Consider an example, you can create different subscription option like daily newsletter, monthly newsletter or offer any particular category subscription. You can use MyMail plugin to offer such different subscription offers. 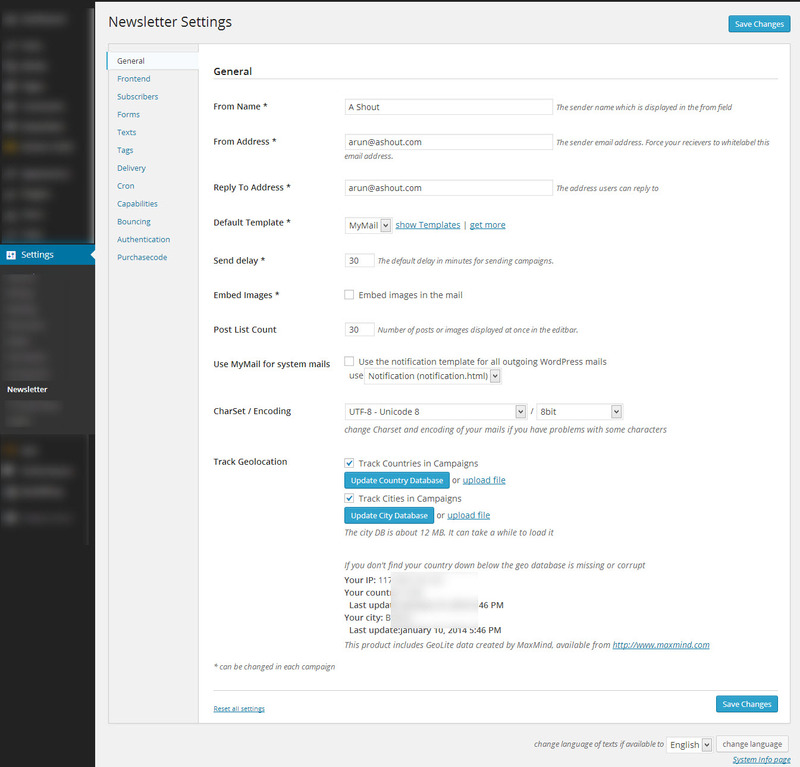 In subscribers tab you will get all info about that subscriber- it includes photo (automatically takes from gravatar) location of subscriber, date and time of subscription, IP address of subscriber, confirmed subscription date, time and IP address and List that the user has subscribed to. It also includes few other stats like no of email opens, clicks etc in statistics tab. You can also unsubscribe any users here. In Manage subscribers you will find Import, Export and Pending (Confirmation) subscribers tabs. In Import tab you can import list of subscribers you have, it supports CSV file or you can manually paste the subscribers details in paste box. In Export tab you can export the subscribers you have collected using this MyMail plugin. In Pending tab you will see the confirmation pending subscribers details. In Delete you can delete the subscribers in bulk. In templates section you will find the different template you can use with you campaigns. By default it comes with only one template, you can edit that template according to your needs or you can upload new templates which you bought. Currently I’m using the default template with some modification. Get detailed stats for every campaign or autoresponder you send to your subscribers. Which includes Total sent, Total clicks, no of receiver, no of opened, no of clicks, no of unsubscribes, no of bounces, which country users opened (If you are subscriber are gmail users, then country stats will not display correctly because Gmail serves all the images from their servers so) and clicks percentage on links on your mails. Get quick stats about your subscribers, campaigns, clicks, new subscribers, new unsubscribers on you WordPress dashboard itself. These are all the settings which we may need during our day to day campaign use. There are more settings options available under Settings >> Newsletter. I will explain what are all settings you will find here. In newsletter settings you will find 12 tabs. These are all one time settings or here we are going to set default values for our newsletter. Once you bought you can play with this settings. What I would like to explain in this settings page is, in Capabilities tab you set the which user can do which functions with this plugin. 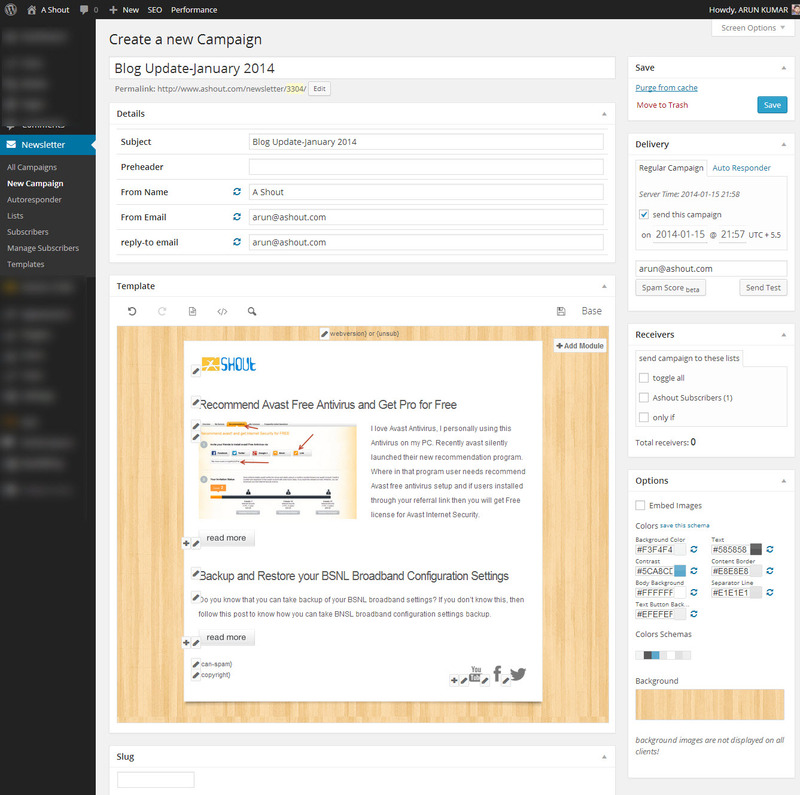 This feature will be helpful if you have multiple users in your blog. In Bounces you can configure this plugin to automatically handle bounces email address, so that undelivered mail address will be automatically unsubscribed. This is one of the main feature that every newsletter plugin should have. It still misses few features like popup subscription form option (you can get this by installing extra plugin), beautiful opt-in form design option. These are the few feature that I’m currently not seeing in this plugin. I think developer should consider adding at least 1 popup subscription form by default in the plugin itself. Also regarding support, He is replaying to every comment which is placed on codecanyon site and to emails that you send to him. I don’t think he is doing this in a right way. I think he should open some forum so that any user can easily search the forum for problem and discuss there itself instead of sending emails or placing comment on codecanyon site. To Whom This Solution is Good? This MyMail plugin is a good choice if you..
Because we are sending mails from Amazon SES so all our mails need to have some quality content. Check out there FAQ’s before you sign up. Once you configure MyMail wordpress plugin with Amazon SES, this is how our mail looks like; which is similar to Makeuseof Newsletter service! Congrats! we have now setup budget Email marketing without burning our money… Go and start email marketing without worrying for anything. In upcoming posts I will write a tutorial regarding how to setup MyMail plugin with Amazon SES. 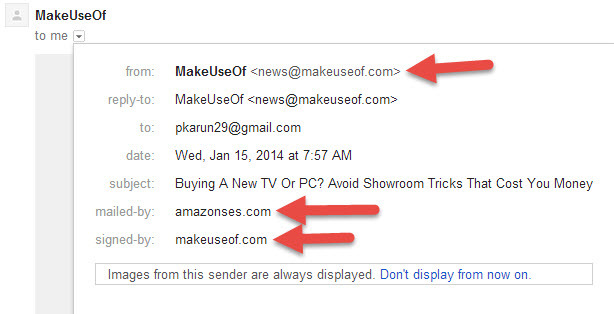 If you have any doubt regarding Amazon SES or MyMail Email Newsletter plugin, then you can leave a comment below. Tip: Looking for Best Keyword Research Tool? Then try Long Tail Pro and Keyword Dominator. Nice review. Plugin really looks great but it isnt cheap. I personally use MailPoet. Arun, Nice post & I completely agree with you. There is another feature that might be missing from MyMail and that is the functionality to work with membership tools like aMember. Presently, aMember can communicate with Aweber & Get Response to see which member belongs to which mailing list. How big of a list do you think this plugin can handle without problems? Have you know people using it to manage big lists? BTW, can you send me the link for the integration between MyMail and amazon SES? I’m not sure about the number of subscribers it can handle.. Better you can ask developer itself. very nice review. It cleared many of my uncleared doubts. 2) What happens to unconfirmed subscribers, is there any way to resend confirmation link in bulk? 3) Can we manually confirm unconfirmed subscribers? If so then where the email will land? 4) The cost $39 is onetime & for unlimited subscribers, right? 5) If possible, please review the plugin “mailpoet” the way u have reviewed this. 6) which popup subscription plugin you use? 1. If you have less subscribers then yes but if you have many subscribers then in most cases no. 2. hmm… I think no. Maybe if you request developer can do that I think. 3. Yes, you can do that. 4. one time. Yes, for unlimited subscribers but only for one domain. 5. sorry I never used that so i cannot do that. i believe you did a very good job in this review. im buying very soon thins plug in throw your link. My website is in Digital Ocean, is it possible to use this plugin with Digital Ocean? and i would like to still use in Digital Ocean and can run Email marketing in Amazon? Let me know your thoughts here. Yes you can use it on Digital Ocean without any problem. My sites also hosted on DO. Thank you. Can you please explain step by step? Please note iam using Google Email Services. Still is it possible? Verry nice review. I always thinking about email marketing service like this aweber, mailchimp, etc.. their not cheap. that was free but limited subscriber (ie : mailchimp/madmimi). Now I’m using feedburner for newsletter, & mailchimp+madmimi for offer/promotion. I’ve never communicating with my reader. jetpack may be was better solution, but I dont like because can’t customizing form/design, tracking, etc. Mymail newsletter I guess better solution. I never understand what actually Amazon SES is. How to signup. No proper understanding. I wanna use it. Do you have any kinda tutorial for it ?? No. I never written any articles on Amazon SES. In simple, Amazon SES is a email sending server. Hi , very good this product really is valuable , already I used some programs to manage my e-mail list , bad best of all it was the mymail , integrate it with my capture page with my blog , set up with an SMTP ( mandrill ) and it works very well , and autoresponder sending messages arrive with great quality , it is easy to assemble and has a great all customization is very profissonal the way I like it ! is always up to date , the only problem is that soon the value will increase, I strongly recommend that if you are interested in buying a good autoresponder manager that works with a profissonal appearance and easily integrates into your blog including every post he already sends automatically email your list ! that’s fantastic , I recommend you see the plugin -demonstration before buying ‘m sure you ‘ll like it too ! Awesome article Arun, I will also switch my blog to mymail with amazon ses as I strongly need an inexpensive and reliable newsletter service. I’m using mailchimp right now. Any experience with customer service? I never faced any issue with their customer service. They promptly reply to all your quires. Hi Arun. Did u still use MyMail in 2016 or you already optout to use other email marketing service? Thanks for asking this question. I was about to buy MyMail. Even Sendy seems to have limitations but then how much can we expect…. One thing I didn’t like about Sendy is they say they offer free upgrades only for a particular version series, e.g. 2.1, 2.1.1, and so on… as soon as it hits 3.x they charge for the upgrade. Perhaps worth. Let’s see who wins. Or May be I will just use PHPList. Dear Sir.i am using this pluging and Use Amazon hosting..i am Design Email Latter But Spam Score Are High..How to Spam Score are Normal..